Before booking a tee time, make sure to ask the course pro shop about any clothing requirements. Many golf courses have strict dress codes, and even on those that don't, dressing appropriately is often considered a common courtesy to other golfers. Whether it's wearing the proper golf shirt or avoiding cut-off shorts, every golfer should know what's expected at the course and by others in their group. Golf shirts should always be worn with a collar. Many golf shirts have a breathable material that allows sweat to evaporate, causing less discoloring in shirts around sweat-prone areas of your body. This type of shirt may be a better choice over cotton shirts. T-shirts may be allowed on some public courses, but they are generally not considered appropriate golf attire. Golfers should never wear sleeveless T-shirts or play without a shirt. Shorts that extend to the knee area are usually acceptable, especially in warm months and in warmer states. Gym shorts and cut-off shorts aren't acceptable. Cotton is a popular material for golf shorts, with khaki shorts a common choice. Similar material is common for golf pants, but not required. Many golfers wear pants made of water-resistant material. Pants normally don't have cuffs, which can collect dirt and grass. Jeans or jean shorts are usually prohibited. Although plaid and colorful clothing is seen on the professional tour and there are no rules against it on the course, it's common to wear accenting outfits. You may want to choose a brightly colored shirt with neutral-colored shorts. If you wear plaid, only use one paid element, shirt or pants. Golf shoes are used to create traction, employing soft or metal spikes. Most golf courses no longer allow metal spikes. Golfers who damage a golf green with their shoes should repair the damaged area. When you wear golf shoes, bring a divot repair tool to fix any holes you make on the course. You can also bring other shoes in your golf bag to change into before entering a golf pro shop or golf lounge. 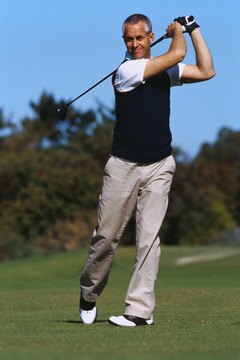 When playing in cooler weather, wearing a vest, sweater or golf jacket is acceptable. These clothing items are often light-weight but will protect you from rain and cold weather. What Should You Wear to Play Golf?